Be the first to share your favorite memory, photo or story of Adriel. This memorial page is dedicated for family, friends and future generations to celebrate the life of their loved one. 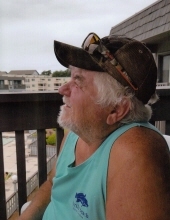 Adriel D. Wolfe, 63, of LeRoy, WV passed away Tuesday, February 27, 2018 at his home following an extended illness. He was born April 17, 1954 at Covington, VA a son of the late Rodney and Dorothy Moore Wolfe. He worked as a electrician at Century Aluminum. In his spare time he enjoyed playing guitars, was a HAM radio operator, watching X-Files, and sitting around a bonfire with his family and friends. He is survived by his wife of 33 years Earline (Milhoan) Wolfe; Sibling Rodney “RE” Wolfe (Margaret) of Covington, VA, Brady Wolfe of Covington, VA, Taynia Gilliland (David) of Mt. Pleasant, TN, and Crystal Lewis (James) of Covington, VA; Children April Wolfe and her son Zebulon Workman, Sarah Watts (Jason) of Ripley, WV, and Jesse (Milhoan) Wolfe of LeRoy, WV. To plant a tree in memory of Adriel D. Wolfe, please visit our Tribute Store. "Email Address" would like to share the life celebration of Adriel D. Wolfe. Click on the "link" to go to share a favorite memory or leave a condolence message for the family.